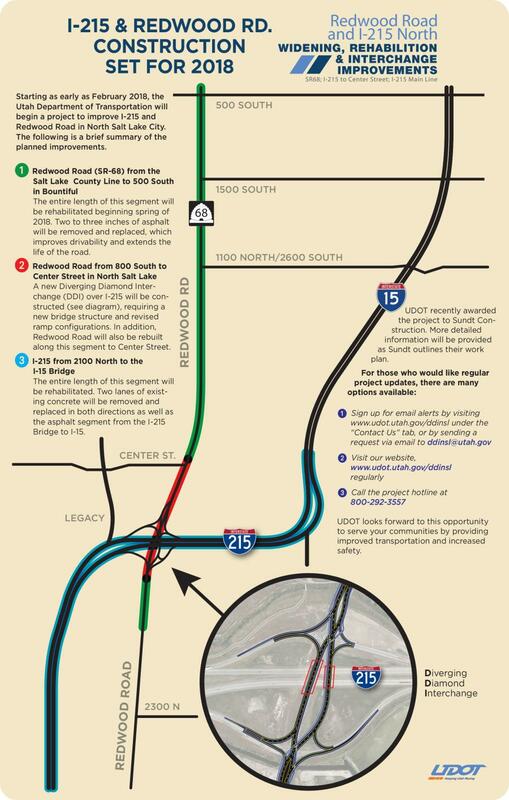 Beginning Feb. 22, the Utah Department of Transportation (UDOT) began a major project to improve operations at I-215 and Redwood Road in North Salt Lake City by building a Diverging Diamond Interchange (DDI). Setting concrete barrier on the east side of northbound Redwood Road, from Recreation Way to I-215, to begin widening to the east. The concrete barriers allow workers to safely perform their work behind barrier and keep the traveling public safe from a steep drop-off. Travel lanes will be shifted between Recreation Way and I-215 to accommodate one lane in each direction and maintaining the right turn lane. The eastbound off ramp will be reduced to one lane to accommodate left and right turns. Lanes will be shifted on Redwood Road from I-215 northward to Center Street for widening and drainage installation. Two southbound lanes and one northbound lane will remain open with occasional lane closures during non-peak hours. Southbound l-215 lanes from Legacy Highway to 2100 N. will be re-striped and lanes shifted to accommodate shoulder widening at 2100 N. All lanes are anticipated to remain open during this phase, with occasional lane closure outside of peak hours. Northbound l-215 will have temporary concrete barriers placed along the outside shoulder to allow crews to build pave a temporary lane safely behind the barrier.